Excellent Bury Free Press article lack of affordable homes being built in the Breckland District. 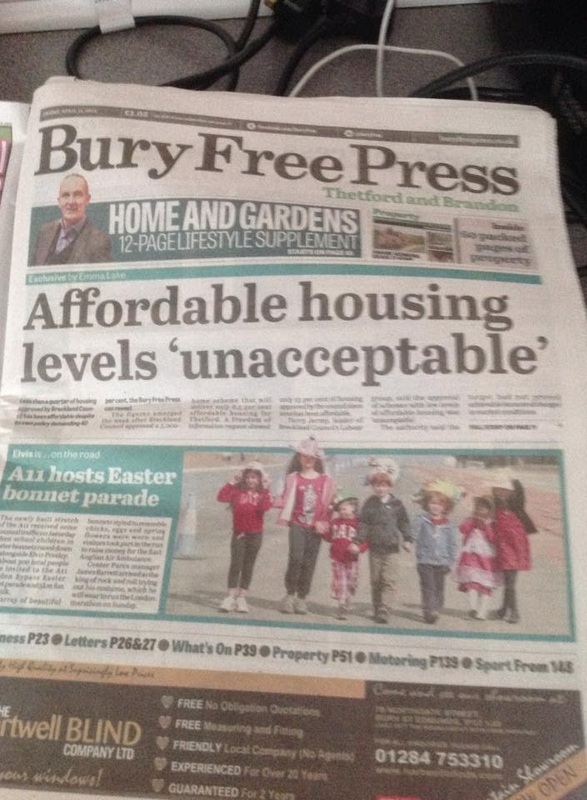 Less than a quarter of housing approved by a council has been affordable despite its own policy demanding 40 per cent, the Bury Free Press can reveal. The figures emerged the week after Breckland Council approved a 5,000 home scheme that will deliver only 8.5 per cent affordable housing. A Freedom of Information Act request showed only 23 per cent of housing approved since 2010 has been affordable. Figures have fallen year-on-year since 2010, last year dropping to 16.2 per cent. Terry Jermy, leader of Breckland Council’s Labour group, said: “More than 4,000 people are currently on the council’s housing waiting list and 3,000 people are in private accommodation receiving housing benefit. “The need is very clear. Housing is a major issue and it’s incredibly disappointing that affordable housing is not more of a priority. “Breckland Council continues to grant planning applications with unacceptable levels of affordable housing.” The authority said the 40 per cent target had not proved achievable because of changes in market conditions. A spokesman said: “In the current market conditions developments with 40 per cent affordable housing are not always financially viable.” This was the reason given for Thetford’s Sustainable Urban Extension (SUE) proposing 8.5 per cent affordable housing. The SUE has been proposed by Kilverstone Estate, The Crown Estate and Pigeon (Thetford) Ltd. It includes up to 5,000 homes, 22.5 hectares of employment land, local centres, three primary schools and playing fields. Breckland Council’s planning committee approved the plans last Friday. At the meeting Simon Wood, regional planning and building manager for Breckland Council, said: “Affordable housing is seen as a bar, rightly or wrongly, to bringing development forward therefore local authorities have to be realistic in regard to their expectations.” It is anticipated the development will be built in five phases over 20-25 years. Will Van Cutsem, director of Pigeon, said: “These plans are the culmination of five years’ hard work to ensure that the development meets the needs of the town and brings significant social and economic benefits to help Thetford grow and prosper.” Mr Van Cutsem said further reviews of the project’s viability would be carried out and if the market improved levels of affordable housing may also increase.